I admit, my taste are all over the place- I love things rustic, glam, vintage and modern. So when Farra was helping me with the table she put together the perfect mix of all and even incorporated a bunch of what we already had! The Heath Ceramics plates that we got at the factory store last Fall were the starting point, those are going to be our dishes for life, I love them so much. 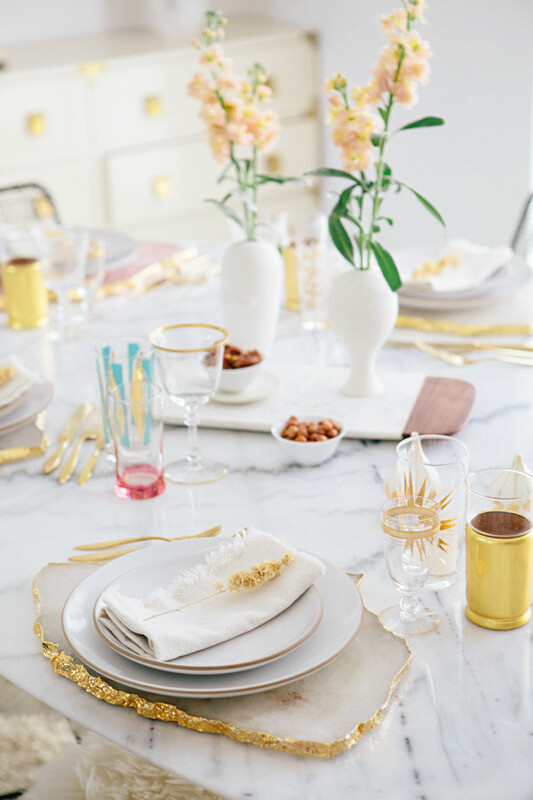 This table is my dream celebration table- what I would love to have for special occasions or anytime I felt like glamming it up a bit. 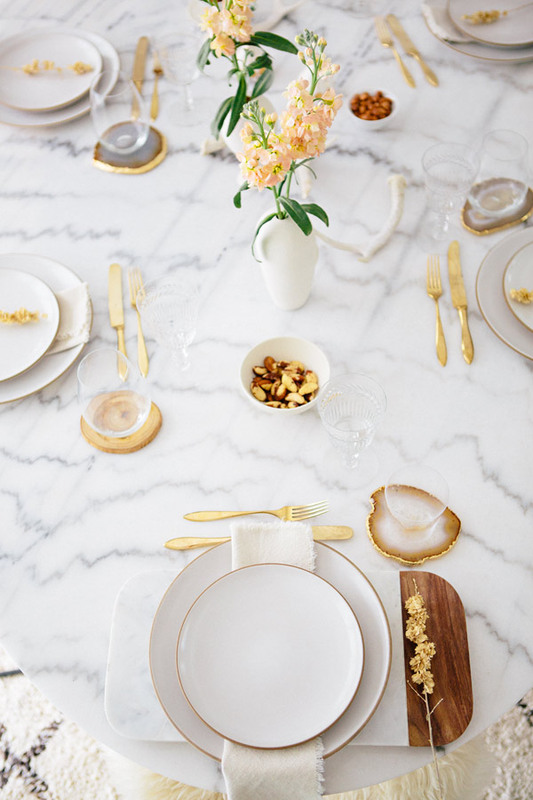 It would be perfect for a girls brunch and at night the sparkle of all the gold would make it so festive and beautiful! 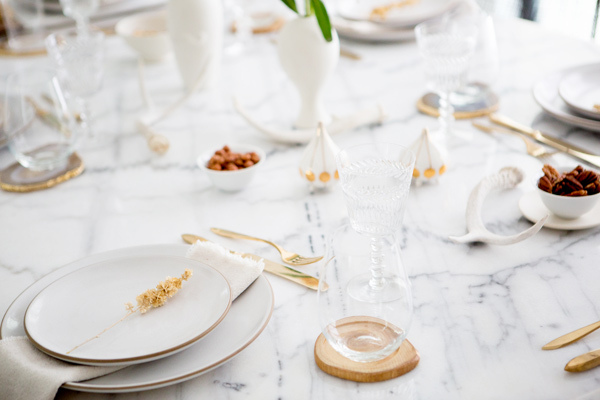 Farra suggested a mix of vintage glasses, some with little bits of color, to keep the table playful. I love the mish mash and that every setting is just a little bit different. And these platters are a dream, an absolute dream! 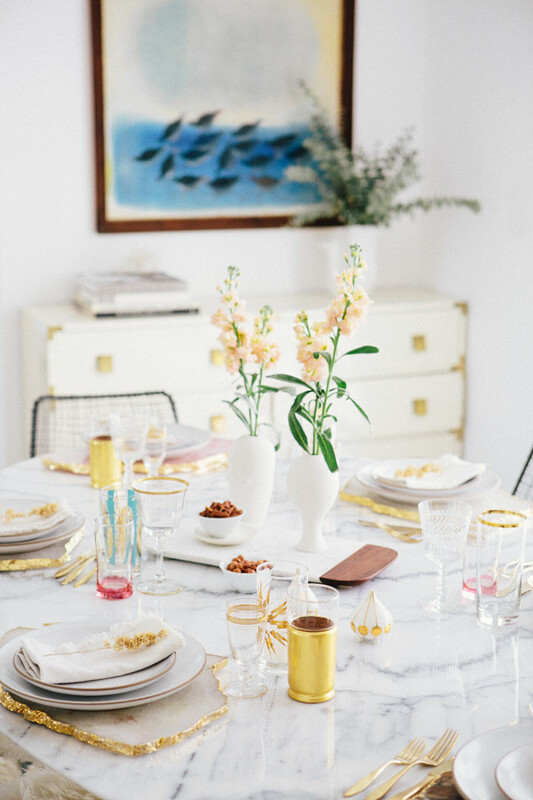 When you’re dressing your table, look around your home (inside and out) to find things you can add to it. This keeps it fresh and allows a bit of change without an investment, which I love! 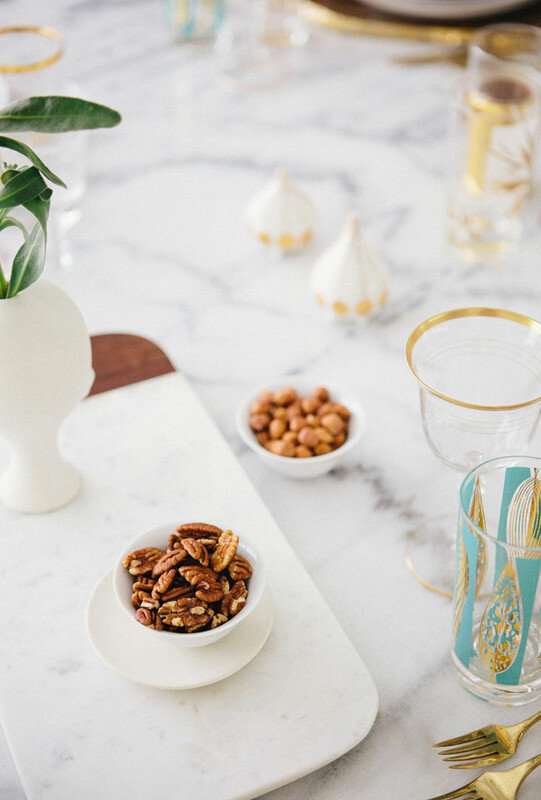 We incorporated these dried flowers that Lou found in the desert, little bowls of nuts, a couple of vases that normally decorate my shelves and my favorite Jonathan Adler salt + pepper shakers. 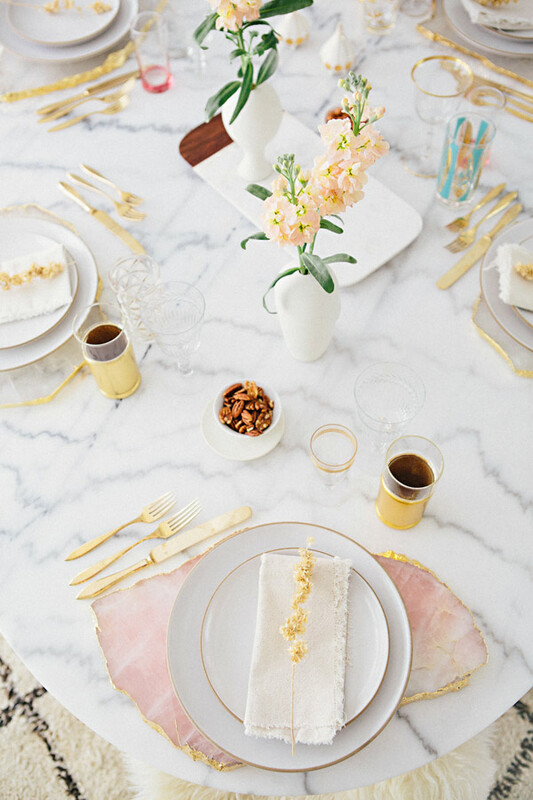 While I’m obsessed with the feminine glam table above, Lou would only get on board with it for special occasions. Honestly I would happily use the above table set up for even the most casual dinner get together, but I wanted to come up with a compromise that Lou would love for our regular entertaining table. Luckily Farra jumped in and flushed out Lou’s taste- modern + minimalist with a few more masculine touches. Truth be told he’d like it a bit more minimalist and masculine, but the table below is totally a happy middle ground of our tastes! The serving board we used in the center of the first table became part of the table settings for this table. I love the marble and the wood brings in a bit of masculinity for Lou. 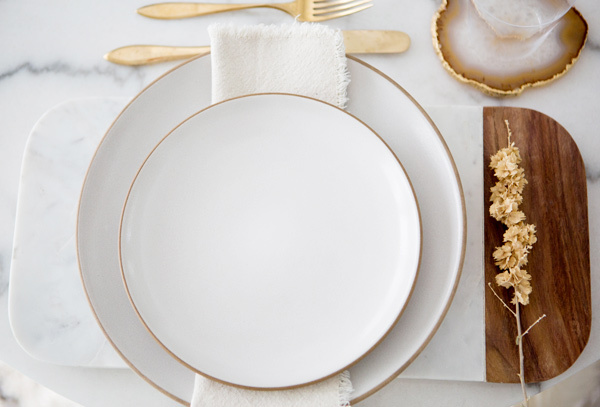 We downsized the gold rimmed platters to coasters and mixed in wooden coasters and antlers to tone down the femininity. 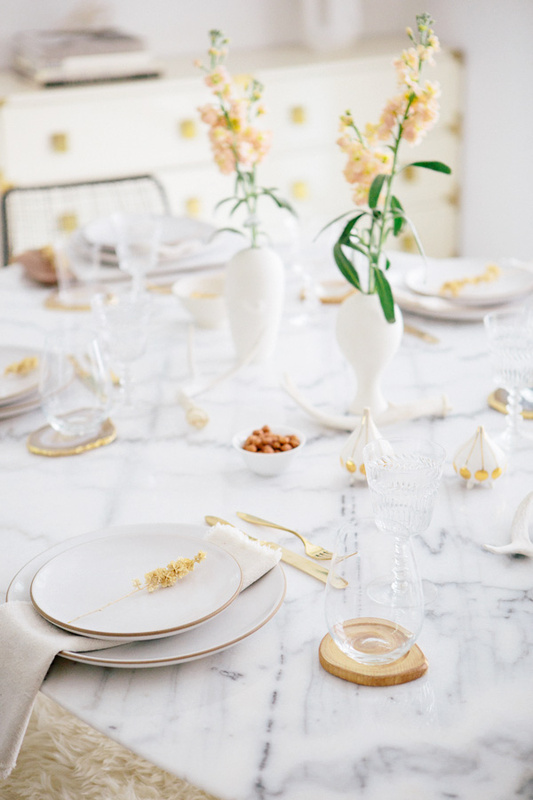 The clear glassware on this table makes it a bit more casual and perfect for the average dinner party. The vintage flatware that Farra sourced works perfectly for either setting and the napkins, plates and dried desert flowers were also used in both. I don’t know why but it never really occurs to me to play around with the napkin and where the flatware is on the table, so it was really fun watching Farra pull it all together! 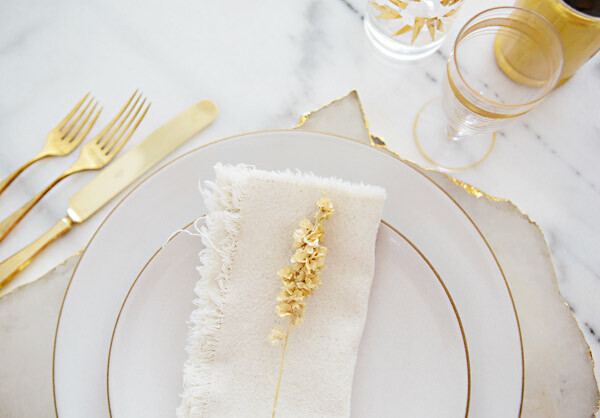 I learned so much and once I save up a bit to purchase a few of her suggested items I will truly have my dream table settings! Then all that will be left is to have amazing dinner parties! 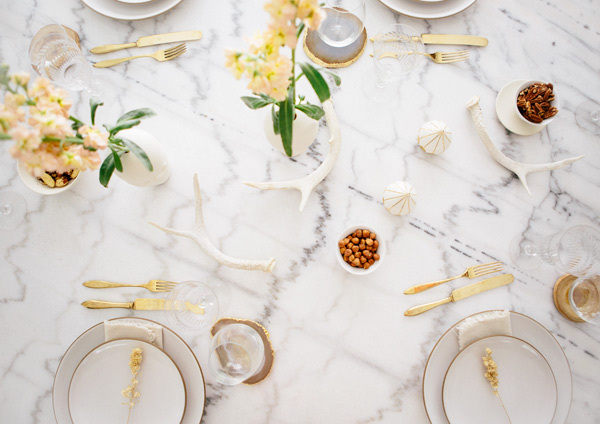 Farra is available to consult and source for tables, and she also has a pretty insane collection of rentals for weddings and events, so pop on over to Hostess Haven to check it all out! 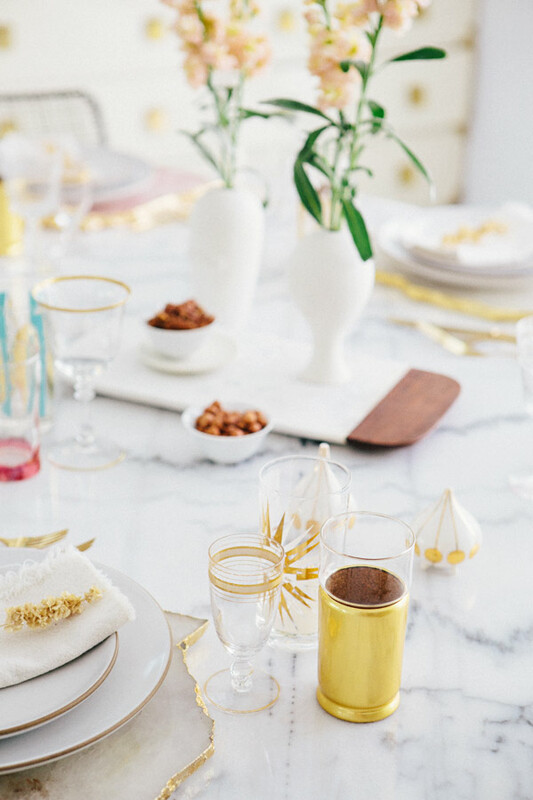 where in the world did you find those gold-rimmed platters? they are fantastic! 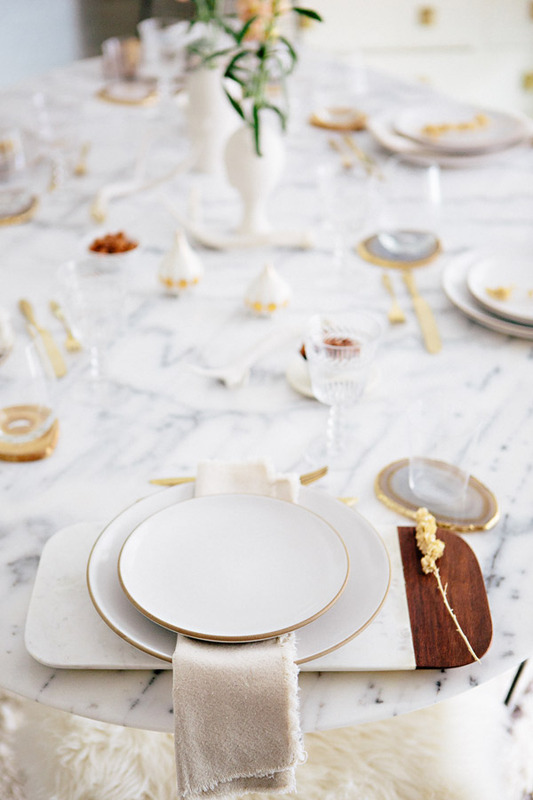 So many beautiful table settings! Perfect inspiration for my client’s upcoming birthday party for her mother. I can’t wait to show her these. 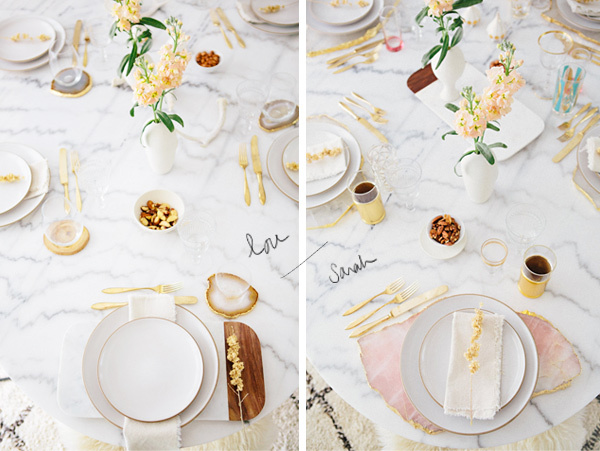 Both of these table settings are absolutely stunning! 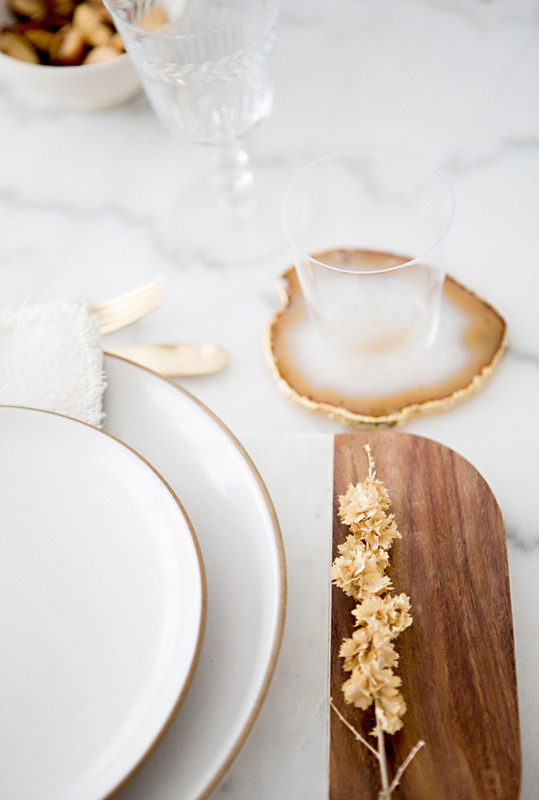 I love the geode place mats and coasters, its subtle but gives it a very lux feeling. I'd be happy to eat at either/both of those tables nightly! I also love everything about the entertaining process! Where are the gold-trimmed chargers / placemats from? AMAZING. Also, where did you get the gold cutlery? Love the explanation for all the photos and the different ways to switch things up. I love the masculin touch for Lou with the napkin under the plates and the switch from the table stones to coasters (btw, those 'place mats' are UNREAL–sooo beautiful and unique). The coaster are beautiful too and I would never really think to use coasters at the dining table or like you said, mix up the positioning of the flatwear. BRAVO, Farra (& Sarah!). What an exquisite table setting! So fresh and clean with lovely natural tones. Extremely inviting! SO pretty! And love those dining chairs! So pretty! I love every little detail! I must know where that table is from, please share!! 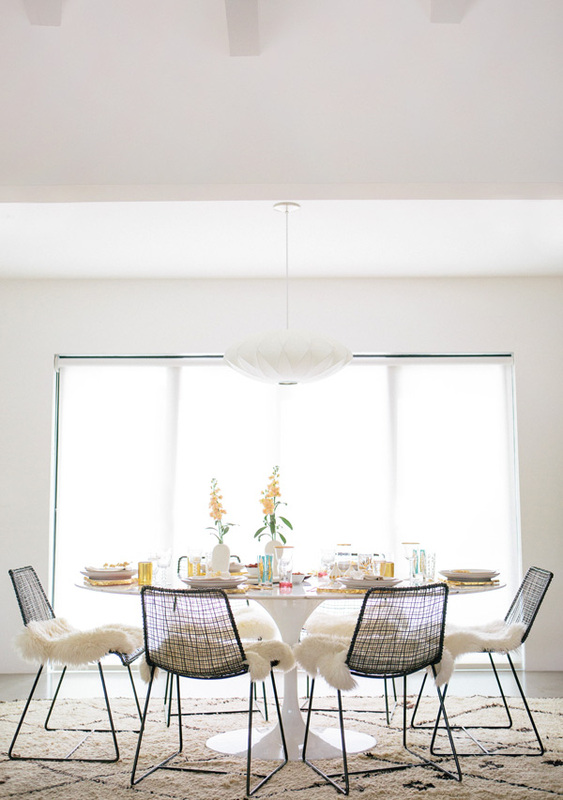 just love creativity of a dining table..
Where can I purchase the light fixture?